As Cholera Surges In Haiti, Aid Withers Away : Shots - Health News Between April and June, the Haitian health ministry reports more than 86,000 new cholera cases. Meanwhile, health workers say the international support that came to Haiti's aid during the peak of the epidemic last fall and winter has withered. 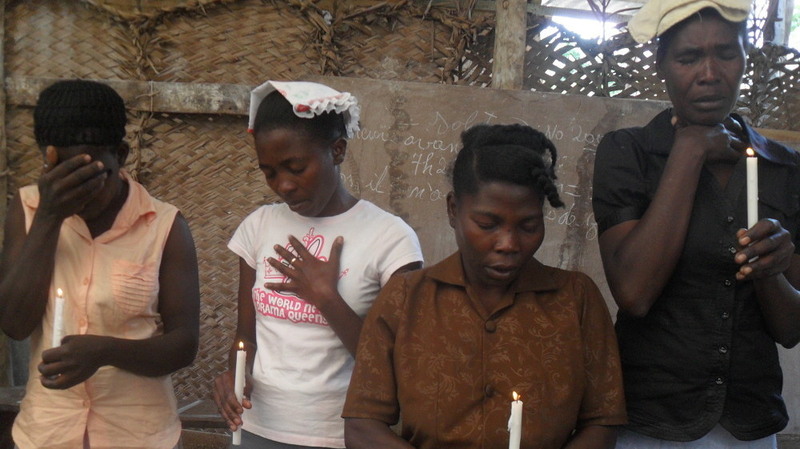 Mourners attend a memorial service for recent cholera victims in Haiti that took place Wednesday in Savanette, an isolated community in the mountains outside Mirebalais, Haiti. Cholera is back in Haiti. Well, in truth, cholera hasn't gone away since it was introduced last October, possibly by infected U.N. peacekeepers from South Asia. And undoubtedly cholera will plague Haiti for many years to come because it's nearly impossible to eradicate from the environment. But new numbers show an upsurge in cholera since the rainy season arrived this spring. Between April and June, the Haitian health ministry reports more than 86,000 new cholera cases – one-quarter of all the cholera reported since the beginning of the epidemic. In 11 largely rural communities, Shots has learned, cases nearly quadrupled between April and June, from 3,932 to 14,425. Cholera hospitalizations in these areas went up nearly six-fold. Meanwhile, health workers say the international support that came to Haiti's aid during the peak of the cholera epidemic last fall and winter has withered. "We have a smaller pool of people responding and similar caseloads to what we were seeing the later part of last year," Cate Oswald of the medical aid group Partners in Health told Shots. "So we're working double- and triple-time with very limited resources. We're quickly going through dedicated cholera funds." Speaking from Mirebalais, a town 40 miles northeast of Port-au-Prince, Oswald says the latest surge in cholera cases has been relatively invisible in the most remote towns and villages, sometimes inaccessible to cars or trucks. "In areas where there are zero latrines and no effort to improve water hygiene, we're seeing caseloads as high as the early days," Oswald says. "When the rains come, as people defecate in the fields out of necessity, all this is running into rivers. So it's just this ongoing cycle." Recently, Oswald says, she got a call from a health worker in Petite Montagne, a hamlet five hours by foot on a rutted mountainous road from the nearest clinic in the Boucan Carre region. The health worker reported 14 people who needed to get to a cholera treatment center immediately. Untreated, cholera can kill within eight hours from overwhelming fluid loss. Timely treatment with rehydration is cheap and life-saving. The Partners in Health clinic in Boucan Carre had been aware of a cholera outbreak in Petite Montagne because dehydrated patients had been arriving by stretcher, carried for hours by family members over the rutted road. In the past two weeks, the group realized it had to get more help to the mountain town. "Petite Montagne has needed help for months," Oswald says. "But when we realized how many people are being infected in this new wave, we said there's no way we can't do this." It took a day and a half to mobilize supplies and workers and walk them to Petite Montagne. In responding to cholera, time equals lives saved. So Partners in Health recently purchased 120 cell phones for about $10,000 and is distributing them to its far-flung community health workers. The phones have been programmed (in Creole) to allow easy input of cholera cases and deaths, how much oral rehydration and intravenous fluid packs are on hand, where trucks are needed to take the most severely ill to treatment centers, and how much water-purifying tablets and bars of soap are available. "As the rains have come, it's been incredibly hard to get this data," Oswald says. The cellphones will help speed the response and give the Haitian ministry of health a better picture of what's happening in rural areas. Meanwhile, debate is still grinding on about whether to deploy cholera vaccine to reduce the accumulating numbers of cases and deaths. So far Haiti has counted nearly 380,000 cases and more than 5,500 deaths since mid-October. Earlier this month, a meeting of vaccine advisers to the Pan American Health Organization in Buenos Aires recommended small-scale projects in Haiti to vaccinate against cholera in "underserved urban and rural areas." Last December, a high-level meeting of the Pan American Health Organization in Washington concluded that large-scale cholera vaccination should be considered in Haiti. But the Haitian government, worried about civil unrest among people who couldn't get vaccine, turned down one manufacturer's offer to donate tens of thousands of its vaccine. And this month, PAHO's expert advisers worried about competition between vaccination against cholera and other diseases. Meanwhile, health workers are trying to cope, anticipating that cholera caseloads will continue to increase. "August and September are the peak hurricane months, and we notoriously have very heavy rains in that time," Oswald says. "So we're preparing ourselves. We're putting cholera treatment centers under tin roofs with plywood walls and concrete floors instead of tarps and tents. We know cholera is not going away."